Customer Notice are notification or warning sent to the customer involved in a project. The information recorded can be used for future reference. Also, companies may use this form to automate the variations they wish for the Payment Claim System forms. 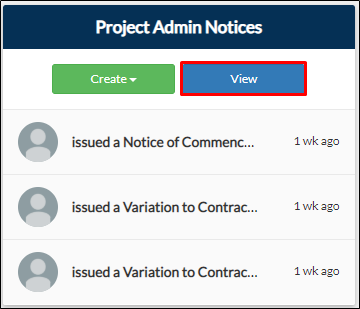 From your project page, go to Construction tab then click View on the Project Admin Notices. From your projects dashboard, click the Reports button. Locate the Project Admin Notice Report then click View Report. This can be found under All or Construction tab. 2. You will be redirected to Project Admin Report page where you can view all the submissions. 3. Click Documents to to attach files to your submission. You will be directed to the Documents page. My Computer button allow you to upload files from your device. Google Drive icon allow you to upload files from your Google Drive account. Dropbox icon allow you to upload files from your Dropbox account. OneDrive icon allow you to upload files from your OneDrive account. 4. Click the Add button to add another row for uploading documents. 6. Click Download if you want to have a copy of the attached documents.